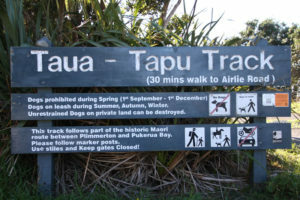 The track, an old Māori trail, ran from the Taupō settlement, over the hill and north to Waimapihi Pa at Pukerua Bay. No longer used after roads were built in the area it is now a signposted walk that starts at the top of The Track and roughly follows part of the route. This track was used by various peoples passing through the area from the early days of Māori settlement. When Ngāti Toa Rangatira moved south from Kawhia around 1820 and settled in the area, the track provided important access to Te Rauparaha’s Taupō Pā at what was later to become Plimmerton. 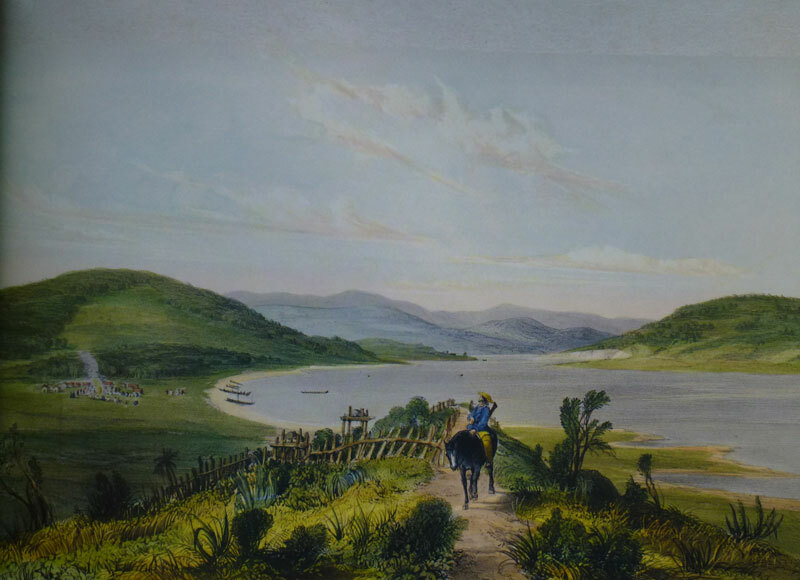 ‘Porirua Harbour and Parramatta whaling station Novr 1843’, by Samuel C Brees, Chief Surveyor to the NZ Company, looking from Taua Tapu Track towards Taupō Kainga (now Plimmerton). Running from Paekakariki south along the shore line, the track rose up the hill to Waimapihi Pā at Pukerua Bay. From there it followed through nearby gardens, down the valley to the north end of the Taupō Wetland, and up over the hill to Taupō Pā. 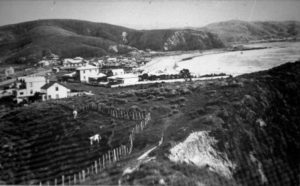 Looking down the south end of the Taua Tapu Track towards Steyne Avenue and Plimmerton Beach about 1904. References to the track suggest that the section from Pukerua Bay to Plimmerton became known at Taua Tapu during the 1840s when tensions between Maori and the settlers were at their peak in this region. It is said that Te Rauparaha’s nephew and ‘fighting general’, Te Rangihaeata, declared the track his backbone to stop it being used for transporting supplies to the settlers. It was also considered tapu because of its use by war parties (who were sacred), and the movement of arms to Pauatahanui and Horokiwi. After 1846 when British troops arrested Te Rauparaha at Taupō and Te Rangihaeata moved north following a confrontation at Battle Hill, the track remained an important north-south route through the area. It continued as a mail route until the road was developed between Pauatahanui and Paekakariki. During the early days of European settlement it was known as Pukerua Track. Much of the early subdivision of land relied on the track for access. Parts of it remain a right of way today. From Steyne Avenue take Motuhara Road and branch up The Track to its end at the top of the ridge. From there, walk along a sealed driveway to a blue marker post on the right, which takes you down to a gate and the beginning of the path through farmland. Follow the blue marker posts, passing through gates and over a style before zig-zagging down to Airlie Road near the railway line. The walkway from the top of The Track continues along a driveway for 300 metres to a high point adjacent to the bush. Along this link there are views to the west of Mana Island, Cook Strait, and, on a clear day, the top of the South Island. There are some excellent stands of native bush in the vicinity, mainly in private ownership. Further to the north is partly bush-covered public reserve. The five minute detour to the heart of this reserve is a pleasant walk with bush on either side. Motor vehicles and motorbikes are not permitted on the walkway. Dogs and horses are permitted, but must be kept under control and dogs must be on a leash. Please appreciate that the ridge section of the walkway passes through private farmland. Walkers are asked to stay close to the fences, follow the marker posts, use the stiles, and leave the gates closed.